Hello! The big day is almost here! One thing I've noticed around the web is how excited people are for Valentine's Day this year. I'm sure it has a lot to do with the fact that the holiday is falling on a Saturday. And if that's the reason, then they need to re-do the calendar so that Valentine's Day falls on a Saturday every year, because I'm loving how excited everyone is to share the love! He is an animal lover, so I thought he'd like this image. The image is from JustRite and is pretty old, so I'm not sure it's available anymore. Would you believe this is the first time I ever used it? Of course you would! Most of my stamps have never seen ink, that's why I'm on a stamp buying freeze (until I see something super cute I have to buy)! This is a very large image and took up most of the space on the card, so I didn't add any layers or embellishments. Because the image is the entire focal point of the card, I wanted to be sure I colored it to the best of my ability. My next gift was actually a practical joke. I remembered having a conversation with my kids awhile back about how my son never saw the movie 'Ghost'. I was shocked. I said 'How could you have never seen the movie 'Ghost'? It's one of the best romantic films of all time?' So when I was shopping for Valentine Candy and saw this DVD for only $5.00 I decided to get it and put it in his care package. Of course, the joke ended up on me, because he texted me shortly after receiving his gift saying he saw the movie already and playfully called me a 'wierdo'. Well, that resulted in more texts about my recollection of all our previous conversations, of which he replied that he didn't recall any of those conversations. Oh well, it must have been my other son. Oh wait, I don't have another son! In any case, I still presented his DVD in a pretty, romantic package. I stayed away from the girly colors of pink and red, and I chose a blue designer paper to keep it on the masculine side. To cover the DVD I simply laid the item on top of the designer paper and scored the paper, cutting off the excess. I did a second score to account for the depth of the item, and folded along those scores. I then slipped the DVD inside and cut two more sheets of paper to form a band around the product. I did a layer of white card stock 1/4 wider than a complimentary designer paper so that the second sheet of designer paper would stand out more. I finished off the package with a quote pre-printed on vellum, and a felt embellishment. I usually do a Fashion Over Fifty post on Fridays, so those of you who have come to my blog looking for that might be disappointed. I just had too many Valentine posts to get through this week, plus the Eva for Loverly launch, that my normal posting schedule had to be altered. However, I did want to show you what I will be wearing for Valentine's Day. I was at J.C.Penney last week and I noticed they were starting to get their new spring items in. The company created a new line called 'Stylus' that absolutely blew me away! I ended up buying three items from this new line because I loved it so much. This line is so me: it's casual, playful, whimsical, comfortable, colorful, and very creative. I wanted to buy everything in this line, which is something I would have done if I was still working, but now that I'm unemployed, I had to restrain myself to only three pieces. 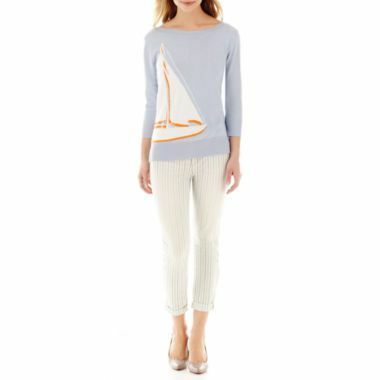 I ultimately decided on one top, a spring sweater, and some striped pants. 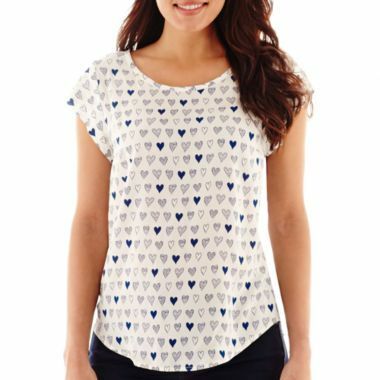 I picked this top because I not only wanted to wear it Valentine's Day, but I also loved the fun, whimsical print, the feel of the fabric and cut of the shirt. It's a loose fitting top, which I always prefer to help hide my flaws, and I love the scoop neckline and princess cap sleeves which are always flattering for my body type. It also has a really cute opening in the back which you can see HERE. Now it's suppose to be bitter cold here in Wisconsin on Valentine's Day so I plan on wearing this top with a blue blazer and jeans. I'll be sure to post pictures next week of my Valentine's Day outfit. But I can't wait to wear this top in the spring or summer too! It is so versatile because of the style and color it could be worn with shorts, jeans, even a skirt! I love it! Is this the cutest sweater or what? It's absolutely perfect for spring in Wisconsin when you reach that point where your dying to ditch the dark colors and heavy sweaters, but it's still too cold yet. It is a very thin sweater, and the color is perfect for the warmer seasons. I don't know what it was about this sweater, but it just spoke to me and I had to have it. I don't own anything like this. Maybe it's just my longing for warm weather and long, lazy days. I don't know. 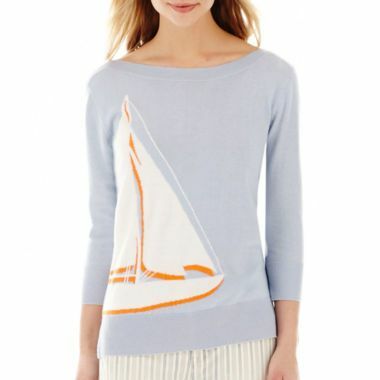 I just loved the feel of the knit, the boatneck, and the whimsical image. It will probably be another two months before I wear this sweater, but I could tell this new line at JCP was going to be popular by how picked over everything was already. Oh, they had such cute things! How I wanted to buy more….but I restrained myself! I already own white ankle pants, but they can be kinda heavy for really warm weather. I really loved the subtle stripe in these pants, and I find I'm wearing shorts less and less, so I'm always on the lookout for lightweight pants or skirts to wear instead. You can get a better look at the colors in the stripes of these pants HERE. I can't wait till it's warm enough so I can wear my new JCP Stylus clothes. If you haven't been to J.C. Penney's in awhile, you really need to check them out. They've been working really hard to improve their store and it shows! So what about you? What plans do you have for Valentine's Day and what will you be wearing? I'd love to hear from you! I have been admiring that adorable heart top! Love the beautiful cards you made. Happy Valentine's Day, Amy! That elephant is ADORABLE!! I'm sure your son will really appreciate that special care package and I still do it for my boys too! :) Red Velvet cupcakes is what they got! Love that wonderful non-traditional Valentine with the sentiment...really brilliant quote by the way! Thanks for sharing and have a great weekend! Such a cute card Amy, love the image and perfect matching sentiment too!! Fun idea with the movie, although he already watched it. But it's one of those that can be watched more than once. Not much planned for Valentine's Day for us. I made cute bookmarks for everyone (Will be on my blog tommorrow). Then the kids and I will bake some valentines cupcakes together while hubby is at work. Hey Amy!! Your card is so cute. I love how you colored that cute elephant. Your son will love that card. I agree everyone should she the movie ghost but the best love story to me is the Notebook. Now that is a great love story of all time. Thanks for playing along with us this week at CASology.